Clear all jellies and reach 1250000 points to complete the level. This level is hard as you need to break lot of jellies with blocker and need special combos with balancing the Odus owl. For this level you should try to break blockers and make special candy or colorbomb where you get chance and break it with balancing the owl. You should try to break all blockers as soon as possible because as moon will struck will break jellies automatically and not blockers. You might need colorbomb with special candy combo to reach requirement and play till last move as you could get chance anywhere to reach requirement. We completed this level with 319640 score using above strategy and luckily got colorbomb special combo that help to break almost all jellies and got three star score at the end of the level. 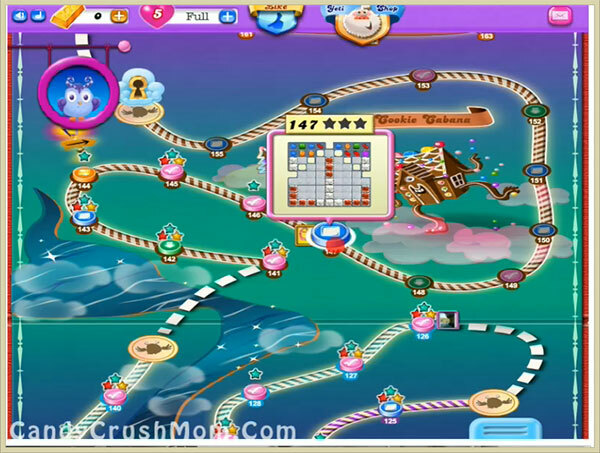 Candy crush level 147 allows only 22 moves! Instead of 50. Please fix candy crush level 147! It’s impossible to pass with only 22 moves! Please fix level 147! It’s only allowing 22 moves! !